William and Matilda de Braose had at least sixteen adult children. Their marriages allied the family to some of the most spectacular names of the era. Two of their daughters became celebrated anchoresses. The second son, Giles was created Bishop of Hereford by Richard the Lion Heart as William attended the King’s death bed. King John’s succession was secured, it seems, by William’s prompt and heroic action in dangerous circumstances. The details are lost, but John entered England for his coronation via William de Braose’s port of New Shoreham. William later captured the rival claimant to the throne, Prince Arthur who was besieging John's mother, Eleanor of Aquitaine at the castle of Mirebeau. Arthur met a nasty death. Some blamed his captor, William de Braose. King John raised William up to become arguably the most powerful man in the land and the Lord of Bramber even extended his reach to Limerick in Ireland. The demise of William and Matilda was a tragic one. According to one story, they knew too much about King John’s personal role in the death of Prince Arthur. King John decided to crush the ageing William and his heir in favour of new men. The King seized Bramber and when the Braoses fled to Ireland, John raised an army to pursue them. William managed to flee to France via Shoreham, disguised as a beggar, but he died a broken man in 1211. It seems he had been unable to raise enough money to pay the debts demanded by King John and died "of grief" upon hearing of the fate of his wife and son. These alleged debts exceeded the annual revenue of England. William’s wife and their heir, William, were captured in Scotland and handed over to King John. Many others in the family were rounded up and imprisoned. In 1210, Matilda and William her son were starved to death in a dungeon at Windsor Castle. Bishop Giles de Braose took up arms against King John. Giles gained custody of his family’s lands but died suddenly in 1215, after a meeting with the King. Giles’ brother, Reginald continued the fight and successfully defied King John’s pursuit of him. Under King Henry III, the Braose inheritance was restored but divided between Reginald and John, the son of the true heir who had been starved at Windsor. Reginald married Grace Brewer, who was the mother of his children, and secondly Gwladus Ddu, a daughter of Prince Llywelyn of Wales. William, Reginald's son, married Eva, a daughter of William Marshal, Regent of England and Earl of Pembroke. Eva and William de Braose had four daughters. He succeeded Reginald in 1228 and fought against Prince Llywelyn for the King. Unfortunately, William fell straight into the hands of Llywelyn. 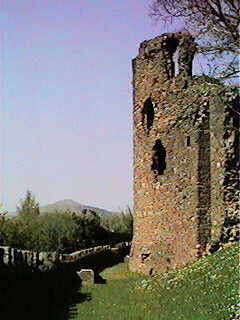 During the months of his captivity, William agreed to marry his daughter Isabel to Llywelyn’s son David, with the castle of Builth as the dowry. Llywelyn drove a hard bargain. William paid a friendly visit to the Welsh court in 1230, possibly to discuss his daughter's wedding, when he was seized by Llywelyn and publicly hanged. The Prince had discovered his wife with William in her bed chamber. Just imagine what a scandal this was! Llywelyn's wife, Joan was a half-sister of the King. Letters from Llywelyn have survived. One was written to William's wife, Eva. Llywelyn advised Eva that the marriage between her daughter and his son should go ahead, otherwise he "could not restrain his men because of the scandal and our outrage". The battle was on for powerful men to marry their sons to a Braose heiress and the result was war - in fact wars, murders and vicious feuds for generations. Many families today are able to claim a Braose ancestry through William's daughters, but not through Isabel and David. Their marriage was childless. The story continues with John, the restored Braose Lord of Bramber. As it happens, he had married Margaret - a daughter of Prince Llywelyn. 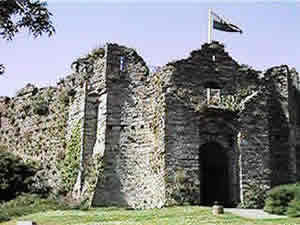 John’s main Welsh residence was Oystermouth Castle in Gower but he died at Bramber in 1232. “He was drawn at his own horse’s tail and so met a cruel death”, according to the Chronicle of the Welsh Princes. This may be why a ghostly white horse is said to have been seen at night, careering around the castle moat. John’s son, William, was too young to succeed immediately and became a ward of court under King Henry III. William had three wives and several children. His third wife, Mary de Ros, gave evidence at a remarkable hearing in 1307 to determine whether Thomas de Cantilupe, former Bishop of Hereford, should be canonised. She and other witnesses told how a Welsh rebel was sentenced to death by her husband in 1290, just weeks before his own death. Mary begged her husband to show mercy. 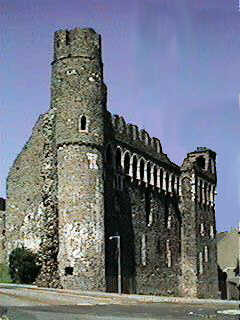 He refused and supervised a public hanging from the great hall window of his castle in Swansea. Mary was unperturbed by the hanged man’s gruesome signs of death and sought the help of the dead bishop, through a traditional ritual. She measured the man’s body with thread, promising to make wax candles using this same length of thread for the wicks. In the event of an answer to her prayers, she would donate the candles to Thomas de Cantilupe’s shrine. The hanged man duly came back to life! This story, with astonishing details of daily life in the Braose family, is told in The Hanged Man by Robert Bartlett (Princeton University Press, 2004). The last William de Braose of Bramber was debt-ridden and plagued by law suits. He was further impoverished by the Welsh wars of King Edward I and the grasping favourites of Edward II. William’s only son (named William, of course) died before him and the rights of inheritance passed to his daughters, Joan and Alina. When William died in 1326, he had mortgaged his property to the King’s lover, Hugh Despenser and Alina was a prisoner in the Tower of London. William didn’t live to see Hugh Despenser hung, drawn and quartered, the King deposed and horribly murdered at Berkeley Castle and his daughter restored to her rights. Through Alina, the barony of Bramber passed to the Mowbray family and, eventually, to the Dukes of Norfolk. can be read on the “Barons de Braose” website.